Illuminate your home or special event with these attractive unscented white pillar candles by Royal Imports. 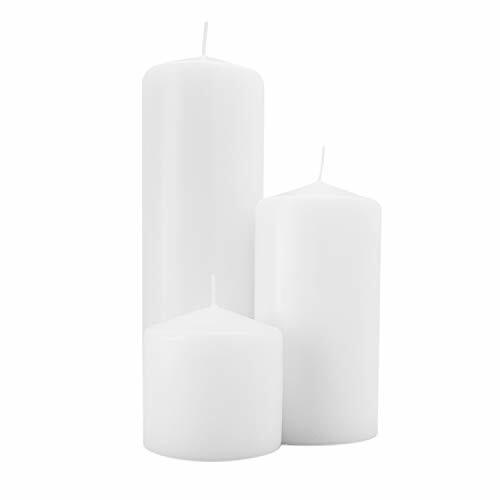 This set of 3 pillar shape candles are crafted with high quality white wax and cotton wick. The combination of these two elements will ultimately result in a clean and smokeless burn. The wax used in these pillar candles are of the highest caliber and is made the USA. It is guaranteed not to drip or melt away fast. The average burn time for the 3x3 pillar candle is 30 hours, 60 hours for the 3x6 and an astounding 100 hours for the 3x9 which gives this set a total of 190 hours of burn time. The extended burn time outperforms most similar pillars and allows you to re-use these candles for multiple events thus adding value to your product. Place it on a table or in a lantern to create an attractive addition to any occasion including, wedding reception, garden, spa tub, bedroom, etc. Royal Imports brings the highest quality candles and candle holders to the floral and event industry. Each set of 3 candles is crafted to perfection thus creating a sleek, flawless accent. QUALITY & SAFETY: Each set of 3 pillar candles is crafted of the highest quality wax to enhance its appearance and prevent it from dripping or melting away fast. All Royal Imports pillar candles are MADE IN USA, and feature cotton core wicks which causes the candles to burn clean and smoke-free. BEST SELLER: This beautiful set of pillar candles are best sellers in the floral supply, home décor, and wedding planning industry. From home decorators, to event planners, a high quality traditional pillar candle is always put to good use. It will enhance any event with its warm light and bring upon a sense of harmony and romance. USES: These attractive pillars are commonly used as: Centerpieces, party favors, emergency light for power outages, aromatherapy, outdoor patio ambience, restaurant tables etc. Because of its extended burn-time, Royal Imports candles can be re-used numerous times. PACKAGING: Pack of 3 candles (assorted sizes) - carefully wrapped to prevent damage. If you have any questions about this product by Royal Imports, contact us by completing and submitting the form below. If you are looking for a specif part number, please include it with your message.